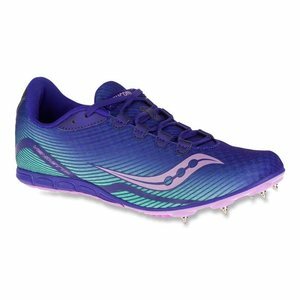 Women's SAUCONY® VENDETTA :: If you're looking for a middle distance spike built for beginning track and field athletes, the Women's Saucony® Vendetta just might be your perfect match. Ideal for the athlete trying to determine what event they hope to make their own, this spike is modeled after the Saucony® Kilkenny. Featuring IMEVA midsole cushion and foot-hugging, lightweight mesh, the Vendetta is designed to offer optimal performance and comfort for the first time athlete.